Career change leads to First Class Honours and a ‘job in the profession that I love’! Natasha RoweAdult Nursing graduate Natasha Rowe from Llansantffraid, Powys, obtained a Law Degree and then went on to work as a legal assistant. She soon discovered that her passion was helping others and enrolled on the Adult Nursing degree course. 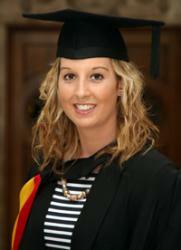 This week she will be graduating with a First Class Honours degree. She added, “Throughout my time at Bangor University I participated in various extracurricular activities such as being a peer guide, a member of the 1000 Lives Society, Royal College of Nursing Student Information Officer, presenting at the University Annual Conference and being part of an Infection Prevention Research Project. I was also the Events Officer for the Nursing Society whereby as a committee we raised over £700 for a local homeless shelter providing them with hot food over the Christmas period. “With my legal past, I was keen to learn more about the legislative and policy development side of nursing and met with Jean White, the Chief Nursing Officer of Wales to enhance my knowledge in this area. I was also nominated for the Royal College of Nursing Nurse of the Year Award. I am currently working alongside a lecturer to publish my dissertation to promote domestic abuse identification in healthcare. Jane Wright, School of Healthcare Sciences, said: “Natasha is an exceptional individual, who will make an outstanding registered nurse. She is kind, compassionate and has a very considered, mature approach. “During her undergraduate nursing studies Natasha took the time to work in partnership with lecturers to prepare students for assessments, by sharing her experiences and giving feedback from a student perspective. She delivered feedback with empathy, encouragement, and shared coping methods which she had employed to prepare for and succeed at assessments. It has been an absolute pleasure working with her over the past 3 years.